I was quiet about my postpartum depression for a long time after I had my son. And nearly just as long, I was also in denial. The moment it hit me that this was my reality was the moment I realized I just wanted to leave my life and my miracle baby, and never look back. My husband and I were engaged in May 2015 and June we found out I was pregnant. We moved our wedding to that August and right after we were married, I was on a plane moving with him to another country that same week we said "I Do." My son was born January 22, 2016, and it was the happiest time of my life...for about a whole two hours. As I stated previously, I had moved to be with my husband after our wedding. I'm American. He's Canadian. So there I was, just myself, new baby, husband, and all his family. I never thought I would need my mom so much during this time. As soon as my mother-in-law came to the hospital, she immediately went into some weird baby obsession. This wasn't a normal new grandma-first grandbaby thing- it was far beyond anything like that. I tried to brush it off as she was just excited, but at the time my husband and I had to live with her, and once we got home, things were a million times worse. Not only did I have the flood of hormones raging through my body that we all experience after giving birth, but I didn't have my mom. Instead, I had someone who was constantly invading my personal space, and not letting me experience anything of being a new mother for myself. My son would cry in the middle of the night and this woman would come from the other side of the house and take my child from me and say, "You're not doing it right." She would just come and take him out of my arms (or even anyone else that was holding him's arms) at all times and call him "her baby." It even got to the point where she would argue with me that in her culture, grandchildren call the grandmother "Momma," not "Abuela" (Spanish for grandma) and that's what she would want my son to refer to her as. It was the darkest and most miserable time of my life to say the least. I would daydream about running away and leaving my husband and son and never looking back. Anything to escape the prison of emotional hell I was suffering in. That being said, I am by no means saying I was only the victim in this situation. I could only take so much and I eventually snapped at her and told her that although he is her grandchild, he is my son and she was to stay away from us unless I told her otherwise. I wasn't very nice about it. I will own up to it. Thankfully, we were able to get a place of our own by the time my son was six months old, but sadly it was too late and I was too far into my depression. My marriage was strained, as my husband felt like he had to choose between his mother and me (I never gave him that ultimatum, I'm not an evil person, I swear). I felt like I wasn't the mother my son deserved because that's constantly how I was made to feel in our previous situation. A few months had passed since we moved into our own home, and while I wasn't crying 24/7, I still felt really angry all the time. When my son was 11 months old, I finally admitted that I needed to talk to someone, and went to see my family doctor. I was prescribed medication to help control my anxiety, and I began talking to god again, and started to dig myself out of my depression. This is something that I continue to work on daily. I remind myself of my worth. I remind myself that god gave me this child because I am the BEST mother for HIM. No matter what your postpartum depression experience is like, you're not alone, as lonely as it feels sometimes. There is light at the end of the darkness, and you are worthy. This too shall pass. Just shy of eighteen months ago, I gave birth to my child. Quickly after her birth, I developed symptoms of postpartum anxiety, later tumbling into depression, which then collapsed into a nervous breakdown riddled with confusion and a desperation for help. I thought I had truly lost my mind. I was so sick, I thought I was going to die. I had shut many people out during my recovery due to shame, an immense amount of fear, and my mind telling me I don’t deserve their support and that I will never be better. My mind told me many lies, but I survived. I survived crippling panic attacks, paranoia, suicidal ideation, toxic shame, obsessions, starving myself, out-of-body experiences, the ridicule of friends and family members who didn’t understand...I survived helplessness in a period that could have been the happiest time of my life. I look back at photos of the first year of my child’s life and feel so much sadness because I know that the mother I see in these photos is in so much pain, feels deeply lost, and scared for her life. No one could really understand what was unfolding inside of my mind no matter how much I expressed my suffering. Not even my own therapist who had been with me since three months postpartum was aware of the nose dive my mental health was about to take. I was alone in my fight against a terrifying darkness. I would have never thought that giving birth would lead to that sort of thing happening to me. I didn’t even know something like postpartum mood disorders existed before I took a birth class. Thankfully, there was an end to my suffering that didn’t involve the end of my life. To this day, I am in therapy and navigating my trauma, giving myself the childhood I did not have, nurturing my needs and reminding myself that for my child to have a fulfilling childhood and future, I must also give myself those things. I remind myself that though it may not feel like things will get better today, they do get better in time. Every bit accumulates into recovery. I am blessed. This I know. I have my life, my child, a future, and that is so much more than I could ever ask for. All of this was nearly taken from me by the darkness. I am grateful that I have made it this far. I feel like I have myself back again. Written by Casey Labandero On April 6th 2017 everything I had ever wish for came true. I was happily married to my soul mate, we had created a beautiful home and a family of two boys and finally a daughter. Ava was my third baby, my most planned, anticipated and prepared for baby. All of my dreams had come true but I was not ok. If I am honest with myself I had signs of anxiety while I was pregnant with my daughter. I could not handle anything confrontational. I left my job five months earlier than I planned because I could not handle it. I worried about being a mom to a girl often. I was a boy mom for nine years. I had never had a mother daughter relationship with my own mother and something inside me kept telling me I was unworthy of my daughter. I just thought I was having normal pregnancy hormones. The day she was born I was so happy and grateful. Our family was complete. My nurse had told me not to put her in my bed because if she fell off the hospital bed onto their floor it would crack her skull. That's when my panic attacks, that I did not even know were attacks, started. I could not sleep while my husband held her so I could get rest because I was so scared something would happen. When the photographer came in to take Ava's photos I felt so panicked because she was taking her pictures on the bed without me touching her. I kept worrying my baby was going to fall off the bed. I remember my sweet husband trying to calm me and get me through the five minutes of photos that felt like hours. When we were finally home I was crying all the time and still could not sleep while the baby slept or while my husband had her because of my worries. I just thought that was normal that I would feel better soon. Six weeks went by like that. I was not sleeping or leaving my house. At my six week checkup with my OBGYN I told him what I was experiencing. He did not care. He just asked me if I wanted to stop nursing and of course I said no. Then he told me there was nothing he could do. He could not prescribe me anything while I was nursing and left the room. Then one day I woke up and I felt empty and scared. The worries that were in my head those weeks before were now on overdrive with no hope in sight. It was a constant replay of worries in my head and no matter what I did I could not escape them. Every time I walked down the stairs with her I could see her falling. If we were in the kitchen everything in there that was sharp I could see hurting her. The thoughts were disabiliateing. I believed I had lost my mind. This was not ok to be scared of everything in our home. Then I was worried I was going to hurt her. I did not have a want to hurt my baby. I had an extreme fear that I would. Then I was scared for my husband to leave me to go to work. The hours alone felt like torture. Then I had the fear of hurting myself. I could not leave our bathroom doors open no more. Walking by the bathroom gave me flashes of ending my life in there. Everytime I looked at her my brain would tell me how selfish I was to have her to only to leave her. Then the depression, shame and hate of my myself flooded me. I did not want to worry or be sad. I hated myself for being sad at such an amazing time. The anxiety and depression took my happiness. They made me believe my life was over, that I would never feel like once did again. I went to my best friend that once struggled with postpartum depression and told her how I was feeling. I told her I was scared to be alone that something was wrong and she sent me away. My body felt like a constant tingle and I was trapped in my mind on a hamster wheel of worries. The depression feeling was the worst. I felt empty and a feeling of dread nonstop. I kept trying to make myself feel better. I went for runs, I went outside, I did yoga and I got out of the house and stayed busy. Nothing I did helped and each time it did not help the depression would get worse. I was drowning inside and no one even noticed. It took about three weeks of feeling like I was drowning with no way to help myself before I could not fake being ok anymore. My husband found me on the bathroom floor in a ball crying and just saying over and over again I dont want to feel this way. I am extremely lucky to have a husband that understood. He told me it wasn't my fault and that he thought I had postpartum depression. Finally!! Just hearing those two simple statements gave me a light in what seemed to be an endless dark tunnel. I went to my regular physican and was prescribed zoloft and in less than two weeks I could feel my head finally raise above the water. I finally felt a little bit of hope that I could swim my way out of this storm. I found a postpartum specialist by calling the PSI hotline and starting seeing her every week then once a month. My daughter is 17 months old now and I can very gratefully say I am fully recovered from postpartum depression and anxiety. At first I wanted to completely erase all memory of my struggle. Now I hope I never forget. Remembering how I felt and being able to feel better reminds me that I can overcome. Remembering that there was a time in my life where nothing made me feel happy or ok, not even my family, makes me appreciate every single thing that brings me joy now. I look at people different now, remembering there was time I was drowning on the inside and no one knew. Now I smile at strangers and when someone is unpleasant with me I do not take it personally because now I completly undestand that we never know someones struggles. The lack of awareness to such a common problem deeply saddens me. My OBGYN could have treated me before it got that bad. I lost months of my life, my last baby's newborn time due to the lack of awareness and I want to help fix this problem. I was lucky my husband understood postpartum depression without that I might not be here. If you or someone you know is struggling please know that you are not alone or to blame and with proper help you will feel better. You will find yourself again! Not only feel like yourself but a even better self. It was Friday of Memorial Day weekend and I was to spend the weekend with my two children, parents, and sister at the beach without my husband because he had to work. Divinely, I was glued to my chair on the front porch of our town home. Oddly, I had all sorts of thoughts racing through my head that kept me from getting behind the wheel and driving myself and my kids to the beach. My husband didn’t understand, and I don’t think I quite did either. While sitting on the porch, I made a phone call to my best friend. I recall that I made sense when I spoke with her, but since my thoughts and ideas were grandiose in nature, it concerned her. Then I called my boss and apparently quit my job; I do not have much recollection of that conversation. My husband told me later that I sat down and quoted scripture that he didn’t think I had ever memorized. He stepped outside for a moment. In that moment, I thought Jesus was returning. I grabbed our kids and begged, “Please save us, our family, and our friends!” I kept repeating those words over and over. Suddenly my husband came back inside and found me looking pale and weak, holding our children. I passed out. He appropriately called 911. Medical personnel responded quickly. As I became conscious, my nursing knowledge jumped in, I promptly and inappropriately told them to pump on my chest and intubate me. I thought I was on the verge of death. Here I was mentally sick. My husband was very frightened and didn’t know what was wrong with me. They took me to the ER where I stayed for two nights. Then I was transferred to the psychiatric unit. How does a 30-year old mom of two with no previous history of mental illness get admitted to the psych ward? This is where my memory fails me, but the diagnosis: Postpartum Psychosis. On the psychiatric unit, I had a sitter with me 24/7 to be sure I didn’t harm myself or anyone else. I stayed on the unit for nearly two weeks—two weeks without my babies, two weeks I did not get exercise or go outside. I ate in my room with the sitter not far from me as well as took a shower with the sitter right outside my door. There are some things I remember but other memories my family told me. My sister informed me at one moment I thought I was Tina Turner, and at another time I thought I was pregnant with Baby Jesus. I do recall thinking I was on the set of Grey’s Anatomy with Bradley Cooper and Mandisa. It shouldn’t have been a bad place then, right? Oh so wrong; it was a very, very scary place! My anxiety and paranoia were both at an all-time high during my hospitalization. I blamed my husband and family for things that were definitely not true. Believe me, when I am well—and my brain isn’t playing tricks on me—I trust my husband 100% without a doubt or question. I remember drawing family trees over and over. I thought the hospital was hell and my ultimate goal was to get out of there. My memory began to return during the last couple of days while in the psychiatric unit. Many people ask me if a switch just turned on one day. The answer is NO. My memory just got better every day. Especially when I was at home. I think it was my safe place and I had a sense of normalcy, or a new normal. I really just think my brain didn’t want to remember the awful thoughts I had while I was in the hospital. While in the hospital, I was treated with antidepressants, antipsychotic drugs, and an occasional injection when my mood and paranoia levels began to increase. I do recall trying to escape and being held down by the staff and probably given an injection to calm me down. Again, I just wanted out of there. It was hell on Earth to me. To this day, I can hardly wrap my brain around how my mind played such dirty tricks on me. But, postpartum psychosis is no joke. After spending nearly two weeks in the hospital, I was discharged home. For two whole weeks, I didn’t see my babies (5½ month old and 2½ year old). I was so excited to get home and see them, but my journey with postpartum psychosis was far from over. When I returned home, things weren’t back to “normal.” I couldn’t be with my children alone. I couldn’t be by myself. I couldn’t drive. I couldn’t return to work. Talk about restrictions! I couldn’t be with my own children by myself? No. Doctor’s orders! I really didn’t fully understand the reasoning behind all of the restrictions. I didn’t even realize I had just been in the hospital for two weeks; I literally didn’t remember. So much of my brain just wasn’t working right and my thought processes were messed up. And, from not being able to go outside during my hospitalization and exercise, I was very weak. I knew I had to trust my family and friends, but there was so much I just didn’t understand. I really didn’t understand what was happening and why. I felt like I was being tortured in every possible way and ultimately being kept from my children and away from society. I was still paranoid and felt like people were following me and my family. There was even a day I thought I couldn’t take it anymore and tried to jump out of my husband’s truck. But, the good news is I got through that day and I’m here to FINISH this story! As part of my rehabilitation, I attended an intensive outpatient program for a few weeks, which involved three hours of daily group therapy. Since I was still out of touch with reality, it was like being in group therapy with my entire family. Each person in the room reminded me of someone, either a friend or family member, and that is who I thought it was. I did not like it. After graduating from the intensive outpatient program, I was then referred to a psychologist and a psychiatrist. I continue to see both doctors to this day. Regular appointments with my psychiatrist assisted to keep my medications managed. At one point my husband thought I was back tracking and it was suggested that he literally hand my medications to me and watch me swallow them. Here I am, a nurse, fully capable of managing medications but my husband stood over me twice a day making sure I swallow my medications! I felt like a child. Eventually, I was able to take my medications without my husband standing over me. Gradually, restrictions were lifted. First, I was able to drive but not with the kids in the car. That felt so good just to be able to get out by myself without a babysitter. I probably just went to Target and got a chai tea latte at Starbucks. Talk about freedom! Eventually I was able to take care of my two children as well as drive with them in the car. My psychiatrist was impressed with how quickly I recovered and took back my mothering responsibilities. But at the same time, I was pretty anxious and scared. Since my psychosis episode, my anxieties had increased and having both girls by myself was quite a job for one person. I applaud stay at home moms-it’s a full time job in itself. My children went to daycare three days a week and stayed with me two days a week once all restrictions were lifted, which was gradual. I continued (and still do) have anxieties when I keep both of my children by myself. There was even a weekend I had to call on my parents when my husband had to work because I just couldn’t do it by myself—and that’s okay. Moms, it’s okay to ask for help because we can’t do it all by ourselves and we can only do so much. Many of you are probably wondering how I got through such an experience. My faith is very important to me as well as my family, and I had a lot of people praying for all of us. I’m so thankful for each and every prayer as it was definitely heard. God’s grace covered my family and has and continues to carry me through this journey. The support of my family and friends truly helped me through each and everyday, especially my husband, and especially those days that I felt like I couldn’t make it through. My physicians, medications and psychotherapy continue to aid in my recovery. My recovery is still going very well and I’m doing as well as to be expected. One day my psychiatrist told me it was like I was a soldier who had just returned home from battle, so yes I consider myself a fighter and a warrior over postpartum psychosis. I am a survivor. I consider myself extremely blessed as I never had ill thoughts towards my children during this whole episode. I have a new found God-given passion to tell my story with other women in hopes to shed light on Perinatal Mood Disorders such as Postpartum Depression, Postpartum Anxiety, Postpartum OCD, and Postpartum Psychosis. My mission is to let women everywhere know that they are not alone. For too long I went around thinking others would think I would be a less together mom if I was on meds, but that’s not true. My husband and I on numerous occasions discussed that I may need to talk about getting on an antidepressant with my physician, but I failed to do so. I’m not exactly sure why, but I just felt like I could fight through it myself. Looking back, if it would have prevented my psychotic episode, I definitely would have asked! Now I’m on meds, and I’ll tell the whole world! It’s for my mental health and well-being! Postpartum Depression is diagnosed in 1 in 7 women. Postpartum Psychosis is seen in 1 in 1000, so it is more rare than PPD. In fact, my doctor said he hadn’t seen it in over six years! I am now a Warrior Mom Ambassador with Postpartum Progress. Please also visit my Facebook page called Into the light: Thriving after Postpartum Psychosis, PPD/PPA. I also am willing to share my story in person to appropriate group settings if contacted. If you suspect that you or someone you love has postpartum psychosis, you/she should be accompanied at all times until a professional diagnosis is received and you/she are under the 24/7 care of a healthcare provider. Written by Daisy Montgomery Ashton was not yet home from the NICU, but I had been discharged from the hospital for about a week. I had always been a vivid dreamer, so I assumed it was simply my brain’s way of coping with the stress of not having our baby home. I did not think they were a big deal, despite images of blood, death, or torture. Yet, as time went on, I noticed a shift in my thought patterns and emotions, and it soon became very clear to me why no one seems to talk about these illnesses. Deep fear began to invade my life, and I found myself terrified of things I have never been afraid of before. I was absolutely certain someone was going to murder me. This became such a concern for me that soon I was afraid of the dark. I wasn’t sure what, but I knew with absolute certainty that something was hiding in the shadows, waiting to grab me if I wasn’t careful. Much like a child, I began leaving almost every light on in the house if I was alone, even running from one room to the other to make sure the monsters wouldn’t get me. Becoming startled by the slightest movement, or perceived movement, became normal for me—even when we spent time at the hospital visiting our son. The nightmares continued, occurring almost every night. Once Ashton was home, my anxiety and panic seemed to subside for a day or so, only to increase to a level that debilitated me emotionally and mentally. Intrusive and horrifying thoughts plagued my mind daily. Even worse, the irrational fear of me being murdered spread to fears of Barclay and Ashton being killed in some alarming way. I felt on the verge of a panic attack getting into the car because what if we had a terrible accident on the way home? What if Barclay died on the way to school, leaving me scared and alone? Nevermind that I was too scared to drive by myself. When I held Ashton, I was frightened that knives would stab his eyes out, or someone would drown him just to spite me. Much like the movie Saw, my mind was a dark place filled with torture and hopelessness. Some quick Google research said that the fear and anxiety I was experiencing was normal as a new mom, but as more time passed I had a growing sense that I was not okay. Despite having a great marriage with open communication, I felt such a sense of shame that I could not bring myself to mention these things to Barclay. I didn’t want him to worry about me, and besides, Ashton was home now…I’d be fine. Right? Meanwhile, the nightmares started to become riddled with homicidal themes and characters that would ridicule me or my postpartum body, telling me I was not good enough until I would kill them from rage. I was exhausted, and forced myself to eat to keep up my milk supply despite having no appetite. I bounced between loving breastfeeding but hating the feeling of a baby attached to me all day. Friends would text me, asking to meet up or to see Ashton, but I didn’t answer. What if they tried to take him away from me just like the hospital did? I couldn’t bear the thought, yet I was hollow and in need of adult interaction, instead opting for the happy façade that Instagram provided. Movie dialogue would trigger thoughts of the scarce memories of the birth and I would zone out, ruminating. I would cry in secret. Guilt seemed to find me at every corner, and the shame made the time seem to slow down so much that it wasn’t until Barclay mentioned that I hadn’t left the house in a week, not even to go outside for a walk, that I realized how much time was passing. At first, I didn’t think anything of it, but later that day when I walked into the bathroom to wash my hands, I realized I could not look at myself in the mirror. I knew I was not well, but felt like I had nothing to complain about since my baby was home and safe. I wasn’t the person I knew myself to be, but afraid of the world and afraid of myself. As I left the bathroom, I saw Barclay holding Ashton and feeding him lovingly. A bolt of anger shot through me because I felt like motherhood was not the experience I was made to believe by advertisements. I did not feel resentment towards Ashton (nor did I ever have thoughts about harming him), but sadness and loss that I did not get the experience I was “promised.” Motherhood was exhausting and a true sacrifice that I was in no way prepared for, yet everything around me made it seem so easy. I loved my baby beyond life itself, but as I watched the bond Barclay and Ashton had, I was sure that my son would never love me because I was a terrible mom—after all, wasn’t everything that happened my fault? Then the thought popped into my head that changed everything. They would be better off without me. Not dead, per se. Just gone. I knew then I needed help. What was wrong with me? It was then I sat on the couch and started telling Barclay everything. I couldn’t look him in the eye, but a lot of relief came over me because I didn’t feel alone anymore. He couldn’t relate 100%, but he knew how hard the birth and the NICU experience had been on both of us. He did not place any blame or shame on me, but instead hugged me and told me everything was going to be alright. I called the doctor and got an appointment immediately. As I sat in the exam room, familiar feelings of dread surfaced. I felt profound anxiety that they would try to take Ashton away, or institutionalize me, or some other scary scenario. I explained everything when the doctor came in, her face soft but concerned. Everything came pouring out like I had been keeping a secret for centuries, tears running down my face. When I was finished, she put her hand on my shoulder, smiled, and softly said, “I can help you. You are not alone or crazy. With help, you will get through this and be okay!” For the first time in what seemed like forever, I felt the rush of hope and understanding. Hidden wounds are often the most damaging. I began a regiment of medications and therapy: medications to help me sleep and therapy to help me restructure my brain’s way of thinking about what happened. Slowly but surely, after over a month of help, I began to feel more and more like my old self…but still very different. I doubt I will ever be the same, but that’s okay. Postpartum Depression and PTSD are insidious because you can’t see from the outside if someone is suffering from them. To a stranger on the street and even to some friends and family, I am the same as I ever was: nicely dressed, smiling, and enjoying life, just like any “normal” person. They don’t know I am struggling with fear and anxiety over things that don’t always make sense to me. On good days, sometimes I even feel like I am “all better,” until a sound, smell, or phrase pulls me into those dark corners of my mind. It reminds me that people do not just “get over” traumatic events and I still have a long way to go. Yet, I have come such a long way in a short time. I can drive by myself to appointments and leave the house without being crippled by fear. I’m starting to see friends more often and answer texts without apprehension. I still have graphic nightmares, but they are becoming less frequent. I’m going to the gym at least three times a week, eating healthy, and I’m completely off the blood pressure medication. I am still afraid of the dark, and I deal with disturbing intrusive thoughts and anxiety every day, especially at night. I still have fears that something will happen to Ashton or Barclay, and sometimes those fears can ruin my whole day. Still, I am happy with where I am considering the place I was and continue to make progress every day. My birth experience and the side effects of it has made me reevaluate nearly every facet of my life: my dreams, my friendships, my career, my health, and everything I knew about mental health. My son unknowingly pushes me to be better and to not accept the status quo. My marriage is even stronger, and the appreciation I feel towards Barclay overwhelms me. He has been my strength, and I could not be more grateful. Life is so fragile, and I don’t want to waste any more time doing things that do not serve my soul or truth. I am more compassionate towards mothers, as I now realize how hard motherhood is, and more compassionate towards those that have PTSD and PPD. There is a belief that those with PTSD are dangerous, but in my experience, we are more scared of you than you are of us, the battle occurring within our minds. We need to begin creating safe environments where people feel more comfortable sharing their struggles, from soldiers to public servants to children to mothers and fathers. The less shame there is, the more people can receive the help they desperately need. We need more awareness and discussion of PPD, as well as resources and support for mothers that suffer from it. We need to let mothers know that PPD is not caused by anything they did. We need to talk about trauma, and the importance of birth experiences. Most of all, mothers need to support each other, even if the path of motherhood for one may not match our own. I was lucky to receive help quickly and have a group of amazing mothers supporting me (you know who you are! )—many do not have that luxury and feel that their situations are hopeless. Reach out and ask your fellow mom if she is doing okay. You never know what difference you are making in her life. As for me, I’m taking it day by day. I don’t know if I will have another child. I don’t know if I would suffer from PPD again, or have another traumatic birth with another NICU stay. I don’t know if I could love another baby the way I love Ashton and be the mom I would like to be. Who would I be today if all of those things did not happen? But, I’ve learned that these are questions that do not need immediate answers…or maybe they will never need answers at all. Sometimes things happen that challenge who we are and change our course of life forever. What I do know is this: I am on a path towards great and wonderful things, navigating this difficult but amazing world of motherhood…but much stronger than I was before. 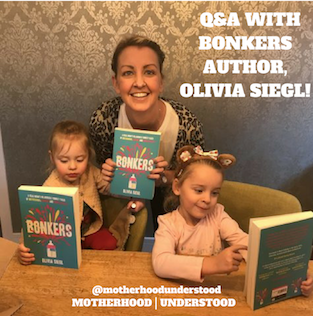 Watch Olivia Siegl, writer, blogger, warrior mom of two precious girls, author of the amazing new book, Bonkers and founder of The Every Mum Movement chat with MOTHERHOOD | UNDERSTOOD about all things maternal mental health, Bonkers, and the movement that was born out of her battle with postpartum depression and postpartum psychosis. Find Olivia on Facebook, Instagram and Twitter. Learn more about The Every Mum Movement on Facebook, Instagram and Twitter. Check out her blog, The Baby Bible and order Bonkers here.